Get to know Amarone wine in Veneto. The Amarone wine is universally recognized as one of the best Italian wines. In fact it is generally rated as one of Italy's three greatest reds, along with the Piedmont's Barolo and the Tuscan Brunello di Montalcino. No doubt it is the most prestigious of the Veneto wines. If you like full-bodied reds, it may be the wine for you. This prestigious red wine comes from the Veneto's Valpolicella hills, in the Verona area, close to the big picturesque lake of Garda. This area boasts a very long wine making tradition: just think that the name "Valpolicella" comes from latin val polis cellae, meaning valley of many cellars . If you are pondering a wine tasting getaway, you might want to plan a trip to this land dotted with vineyards, centuries-old olive trees, cherry trees and superb ancient aristocratic villas. 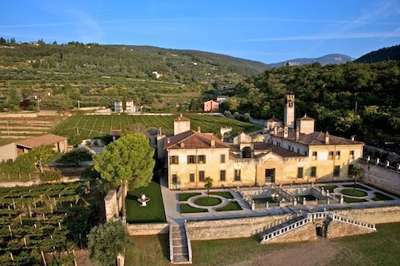 Such a charming countryside, that two Hollywood celebrities like Brad Pitt and Angelina Jolie have very recently bought a big country-style villa in this renowned italian wine region. They were enchanted by those hills on their occasional trip over there, taken while she was shooting a movie in the nearby Venice. So either you love wandering around tasting wine along the world's wine routes, or you just wish a relaxing weekend on the lush Veneto's countryside, this scenic landscape in the Valpolicella might be the place for a getaway. You might want to follow some of the suggested itineraries from one vineyard to another. The local wine farmers will be glad and proud to let you taste their products in their open cellars. There are a series of wine road itineraries marked out with signs, also suggesting the natural and artistic beauties of the area, plus restaurants and trattoria where to stopover. Yes, I would recommend a visit here for fine food lovers too. In many restaurants of the Valpolicella, you can easily enjoy traditional dishes from the local cuisine, along with some of the local wines. It's about a dry red wine, with great body and a high alcohol content: it easily surpasses 15%. The legal minimum is 14%. The name Amarone comes from the italian word amaro, meaning bitter. In fact, the different styles of Amarone wine, have traditionally a very distinctive characther, kind of a irresistible bitterish and raisiny flavor at a time. Alternatively, you may perceive a sweet edge, due to the concentrated sugars the grapes pick up during the drying process. The wine experts talk about flavors of licorice, tobacco, chocolate and fig. That means that Amarone is a wine that goes well with strong flavoured food, like game and ripe cheese. The harvested grapes, picked between the last weeks of September and the first days of October, are ready to face the drying phase, which lasts for several months. After that, they place the dried grapes for maturation in oak barrels, for no less than 5 years. Amarone is a wine that ages in a wonderful way. 10 years old is common for this red. I've only talked about the Amarone so far, but please note that in this italian wine region you'll find a wider range of either red or white wines. A top seller white wine with a long tradition, very popular in Veneto, in Italy, and more and more renowned abroad, is the sparkling Prosecco wine It is made in the scenic Valdobbiadene and Conegliano hills, another great wine and food area. If you prefer lighter bodied wines, with a lower alcohol content, the hills around Verona are also home to reds named Valpolicella or Bardolino wine , and whites like Soave, Recioto and Bianco di Custoza. Veneto is also a great Pinot Grigio maker.